Yes, Companion Animals are Good For Us! Little girl kissing a dog. 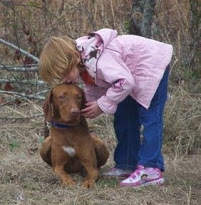 Copyright Nancy Edmund, Solaris Vizslas. “Companion animals provide stability in many peoples’ homes. They offer a sense of continuity over the family life cycle and may serve especially important functions during major life events or critical life transitions such as divorce, marriage and remarriage, widowhood, and becoming an empty nester. It has been found, for example, that children do in fact fare better during their parent’s divorce when they have a connection with a pet (Bennett, 2000)…. Many people perceive that their dogs or cats are wonderful listeners. As their companion animal sits loyally next to them, they spill out all of their emotions toward them. Although some may feel that it is silly to believe that our companion animals understand what we say, it is now recognized that dogs have been domesticated (over the past 10,000 years) to be excellent responders to our nonverbal communication. They have developed a keen sense to read our emotions. The more successful they are at this behavior, the more they are accepted into our pack. This is just one of the traits that connects us more tangibly with dogs than with other groups of animals. Most of us would agree that companionship and friendship are crucial components to our growth during childhood. It makes sense, because the pets take on the roles of playmates and surrogate siblings. With the changes that we are witnessing in nuclear family structure, animals in the home may be providing needed consistency and social support. Pet owners often report feeling closest to their pets, with 85% considering their animals as family members (Walsha, 2009). There is also the fact that 62% of homes have pets (American Pet Products Association, 2011). It should be clearly stated, however, that there is a distinction between owning an animal and truly bonding with an animal. Obviously, the more time we spend with a companion animal, the more we will benefit from the relationship. It is critical for us to consider the degree of bonding when we try to understand the long-term impact of pet-child relationships. If we do not maintain a constant high degree of attachment, the results may not be the same. Studies show that the more emotionally involved a pet owner is, the more likely he or she will develop positive social bonds with lasting effects (Triebenbacher, 2000). One study suggested that 10% of high school youth in a tenth-grade sample reported that their animal-related activities were the most meaningful pursuits in which they were involved (Mueller, Geldhoff, and Lerner, 2013). On the other hand, researchers in Japan studied how having pets in childhood affected elderly Japanese men. The factors investigated included various health issues, companionship, life satisfaction, and loneliness. Their findings suggested that the men who owned a dog in the early stages of their lives rated companionship and social support quite high, because they viewed the importance of their pets in their lives. It seems that animal interaction at a young age may promote healthy companionship with others (human and nonhuman) later in life, which is an important component to overall happiness (Nagasawa and Ohta, 2010). …Regarding positive emotional influences from animals, unconditional acceptance is a large contributor; therefore, it is no surprise that the forgiving nature of animals causes children to rate them in the “top 5 important relationships” (Fine, 2012). Given the strong emotional attachments that are often formed by those who own pets, it may seem like second nature to consider their pet as a member of the family. …attachment figures (as defined by Ainsworth, 1979) have four parts: proximity maintenance (residing nearby), separation distress (negative emotions when distanced), secure base (emotional security), and safe haven (feeling comforted in their presence). While there is little evidence to show that humans rely on dogs as a safe haven, the dependable nature of a dog may act as a buffer against social isolation. This buffer allows them to be considered attachment figures in certain cases. Daly and Morton (2006) report that children with high levels of attachment and engagement with their pets often point out that they were as close to their pet as they are to other members of their family. And, for those who maintain high levels of participation and attachment when caring for their pets, it is apparent that they place their relationship with them in high regard. To learn more about the benefits of animals in our lives and our relationships with them, read Dr. Aubrey H. Fine’s book, Our Faithful Companions: Exploring the Essence of Our Kinship with Animals. This entry was posted in FAMILY DOGS and tagged animal bond, animal companions, animals provide stability, benefits of companion animal bond, benefits of companion animals, bonding with an animal, children and dogs, companion animals, companion animals and stress, dogs, Dr. Aubrey H. Fine, human-animal bond, pets as playmates, unconditional love of pets. Bookmark the permalink.